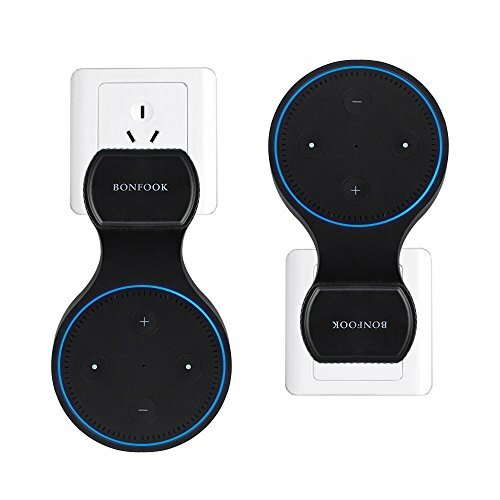 With removable wall mount holder, You can put you echo in any position you want, such as wall, cabinet or anywhere you like, to make it easier to catch the sound and more effective the command is noticed, no more furniture or other items blocking it. With 10cm short usb cord, which also can be hidden in wall amout, you will not worry about the long cord in your house and avoid the cord messy. Also, It will not dangling cords and awkward positioning in our kitchen area. Fit Eco Dot 2nd Gen perfectly, buttons of the speaker remain accessible. Functional wall hanger, designed to work with both horizontal and vertical outlets. Washable glue makes the speaker holder reuse repeatedly. Works on a variety of surface: tile, glass, wood, plastic, metal, etc. It is easy to remove and installation. Short customized power cable is included! 1.All BonFook products are with 30-day full refund policy and 12-month warranty. 2.Any question about the alexa holder, please kindly inform us and we will reply you within 12 hours.